On Golf | The course was great, but the golfer . 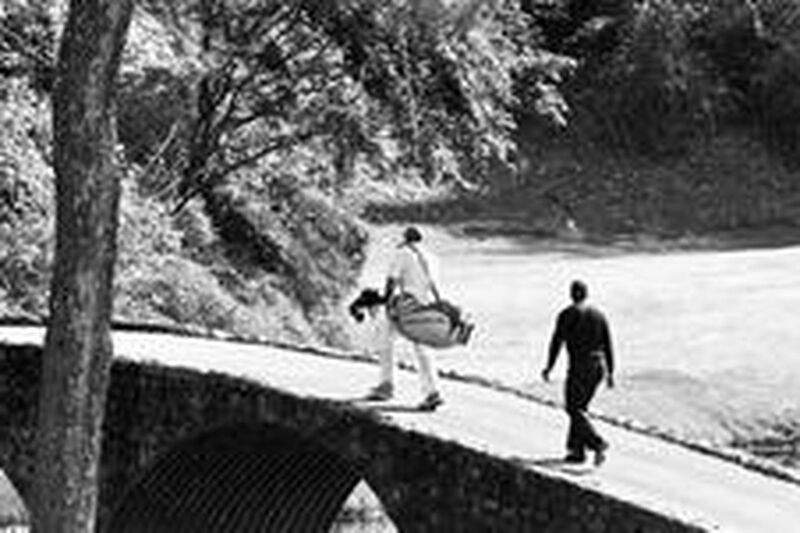 . .
Tiger Woods and his caddie, Steve Williams, cross the Hogan Bridge to the 12th green at Amen Corner, the celebrated 12th and 13th holes at Augusta National. AUGUSTA, Ga. - It was not the way I wanted to end my round at Augusta National. Monday morning, the day after the Masters. Having started on the back nine, I was finishing up on the ninth with the same Sunday pin positions, same slick greens, facing a downhill 12-footer for par. "It's fast," warned my caddie, Rodney, who spent a few years banging around the mini-tours with the likes of Vaughn Taylor and Masters champion Zach Johnson. I tapped my putt ever so gently. The ball had gone no more than three or four feet when Rodney already smelled trouble. "That's gone," he lamented. Sure enough, the ball rolled and rolled, picking up speed as it blew past the hole, still gaining speed as it rolled off the front of the green and down the steep embankment. Just like that, I was facing a 20-yard chip back up the hill to try to save bogey. I'm not complaining. I lucked out again this year, getting a second chance to play the great and glorious course that is home to the Masters. Every year, they have a lottery to pick 30 reporters who get to tee it up the day after the Masters. Once you get picked, as I did in 2000, you're out of the lottery for the next seven years. This was my first year to be eligible again. To answer two obvious questions up front: Yes, strolling the fairways, Augusta National is that beautiful. And, yes, it's that hard, especially when they've got the fairways and greens running at about 20,000 on the Stimpmeter for the Masters. Seven years ago, I shot 85 and moped off the course, feeling like I'd blown shots at every turn. This time, I hit the ball better, hit most of the fairways, made a couple of 10- and 12-foot putts, even birdied the par-5 13th. Yet, when I added it all up, I'd shot 88. In hindsight, upon closer review of my card and the notes I made of my round, it probably had something to do with the triple bogey (skulled a chip over the green, chili-dip the recovery, three-putt) and the four doubles. Of course, playing Augusta National is a treat to be enjoyed rarely, if ever, so the round is not necessarily about saving shots at every turn or playing like you're protecting your lead. It's about soaking up the experience. My attitude is to attack, like I'm trying to come from 2 shots back on Sunday afternoon. If I said it once to Rodney, I said it 10 times: "I didn't come to Augusta to lay up." Problem is, make the slightest mistake or the measliest miscalculation, and you're leaking oil and strokes all over the course. Two of my doubles, I'm flat-out blaming Rodney. Twice, after dead-solid perfect tee shots, he gave me the yardage, then insisted on the club, saying the shot either played longer or shorter than the yardage because of the wind or the shot was uphill or downhill or simply deceptive. Both times, I could not have hit my approach shot any better. I would be standing there in the fairway, posing, imagining Nick Faldo and Jim Nantz oohing and aahing to millions of viewers at this newcomer's amazing and immediate mastery of the course, only to watch the ball splat into the vertical face of a bunker short of the green and sink like a burrowing animal. Now, is that my fault? I think not. Give me and Rodney a few practice rounds together, and we'd be clicking like Tiger and Stevie. So, if you'll spot me those two greens in regulation and the two-putt pars I shoulda, coulda, woulda had, I'm down to an 84 right there. I can live with an 84 on Augusta National with the Sunday Masters setup. My favorite holes? Last time around, it was Amen Corner, the par-3 12th and par-5 13th, and it still is. While the tee shot at No. 12 may be the most intimidating shot in golf, I owe my bogeys in both rounds to death-by-green. When you've made it safely over Rae's Creek and par is on the line, I can gag a three-footer like Greg Norman gagged the '96 Masters. The 13th is the star of the course and maybe the most exhilarating hole I've ever played. Fortunately, this year we didn't play from the tournament tees, which meant going for the green in two wasn't total folly. With 192 yards to clear Rae's Creek, I went for it with a hybrid. I didn't quite get all of it and trudged up the fairway expecting the worst. Luckily, the ball stopped in the second cut just short of the creek. I hit a wedge to 12 feet and sank the birdie putt. My day was made. My least favorite holes? I've got to go with the front nine stretch of 6, 7, 8. If 11, 12, 13 are Amen Corner, 6, 7, 8 constitute Ho-Hum Corner. The sixth is a mid-iron par 3 from an elevated tee. The seventh is a straight-away par 4 that plays 450 yards for the Masters. The only thing remotely interesting is the green complex. The eighth, 570 yards for the Masters, is a long uphill slog that is easily the weakest of the par 5s at Augusta. All in all, to steal a phrase, it was the best of times. In fact, for the whole rest of the day, with pretty much everybody I encountered, I managed to work into the conversation that I had played Augusta National that morning. So, please, if you bump into me on the street or somewhere, don't hesitate to ask me about my round. I will be happy to review it with you shot-by-shot, even the triple bogey.